Ice skating, in one form or another, has existed for thousands of years. Evidence suggests that as long ago as 1000 B.C. Scandinavians were fashioning crude blades from the shank or rib bones of elk, oxen, and reindeer and strapping them onto boots. A game played on ice between teams has been recorded as early as the second century A.D. In the Netherlands, both men and women skated on the canals during the Middle Ages. Scottish history recounts tales of armies crossing frozen marshes on skates to attack enemy territories. Ice skating became so popular in Scotland that the first skating club was established in Edinburgh in 1742. In 1848, E.W. Bushnell invented the first all- iron ice skate that could be clipped onto a boot. During the 1800s, the popularity of ice skating skyrocketed. Skating clubs opened in London, Vienna, and New York. Rinks were built in Toronto, Canada, and in Davos, Switzerland. In 1876, the first artificially frozen ice rink, called the Glaciarium, opened in London. During the 19th century, the sport of speed skating was introduced and classical dance theory was applied to create the sport of figure skating. There are three basic types of ice skates: hockey skates, figure skates, and speed skates. Speed skates are designed for optimum swiftness in one direction, with the skater moving right foot over left. The speed skate features a straight blade up to 18 inches (46 cm) long and 0.03-0.06 inch (0.08-0.15 cm) wide. The blade is reinforced with hollow steel tubing. The boot is constructed of very light, thin leather. Hockey skates are constructed to allow the skater to move both right foot over left and left foot over right. The blade, usually 0.06 inch (0.15 cm) wide, is also reinforced with hollow tubing. The boot is short, measuring 4-5 inches (10-13 cm) from the sole, and reinforced with plastic caps and extra layers of leather at the toe. This protects the skaters' feet from the blades of other skates. The original hockey skate was made of leather with a plasticized sole, a safety tip at the rear, and a hard toe. A ballistic-proof nylon was then introduced that provided even greater protection against cutting. The newest innovation features a plastic molded boot with plastic stanchions and plastic tubing. A heavily padded, removable liner helps to control the fit. Figure skates are fitted with a 0.125-inch (0.32 cm) steel blade designed for spinning. The blade is hollow on the bottom so that only the outer edges touch the ice. A series of sharp angles at the front of the blade called toe picks facilitate landing from toe jumps. The figure skate has a high boot, measuring 7-8 inches (18-20 cm) from the sole to the top, completely covering the ankle. Ice skates are constructed of leather, nylon, plastic, steel, and various other synthetic materials. In most cases, the raw materials are purchased from outside vendors. The ice-skate manufacturer inspects the leather hides closely to insure that the skins have been cleaned and tanned to the company's specifications. Kangaroo leather is one of the popular skins used for figure skates. Knit nylon and molded plastic are commonly used for hockey and speed skates. The leather and nylon are specially treated for water-resistance. Blades are generally made of tempered steel and coated with a high-quality chrome. Some blade manufacturers may add titanium to the metal. The ice-skate manufacturer contracts with outside manufacturers to supply them with blades in various styles and sizes. Competitive skaters (as opposed to recreational ones) usually have their blades mounted by a specialist. The cements, stitching threads, and other synthetic materials are also purchased from outside vendors and stocked at the skate manufacturing plant. Neither the Olympic Committee nor the U.S. Ice Skating Federation has requirements regarding the manufacture of ice skates. However, the manufacturers pay close attention to the needs and suggestions of professional skaters and coaches. 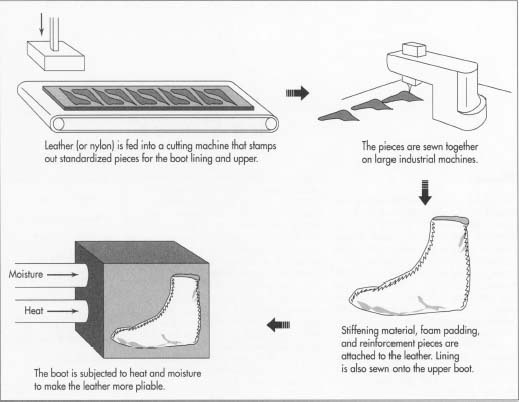 1 The leather or nylon is fed into a cutting machine that stamps out eight standardized pieces: four for the boot lining and four for the boot upper. A similar machine cuts pieces for the tongue, sole, heel, and reinforcement sections. The pieces are mechanically punched with a date code, size, order number, and eyelet holes. 2 The boot is sewn together on industrial sewing machines that the plant workers regulate with foot pedals or control panels. The lining pieces are stitched together at the back and toe seams. The upper pieces are stitched together in the same manner. Stiffening material, called a counter and usually made of leather or plastic, is inserted from the ball of the boot around the heel to the middle of the arch to provide support for the ankle. Reinforcement pieces are cemented onto the underside of the upper with latex or neoprene base cement. Foam padding is layered on top of the reinforcement. The lining is then sewn onto the upper boot through all three layers. Excess edges are trimmed. A line of top-stitching provides additional support and decoration. The eyelet placket is also reinforced by means of a strip of leather. The tongue is lined with sponge rubber, then tacked first to the lining, and then to the boot upper, using a cross-butterfly stitch. 3 The partially constructed boot is then subjected to a heat and moisture process called mulling that leaves the leather more pliable. 4 The boot is shaped by placing it on a last, which is a plastic foot form corresponding to a particular shoe size and width. The lasts resemble shoe trees. A skate manufacturer can have as many as 102 sizes and widths for women and as many as 57 sizes for men. This large difference in number of lasts may be due to several factors: there are more women skaters (particularly in figure skating) than men, thus increasing the variety demanded. In addition, women may be more particular about fit, as evidenced by the wider variety of width and sizes for women's street shoes than men's. First an insole is tacked onto the last. Then the boot is pulled tight, by hand, over the bottom of the last. The worker must make sure that all wrinkles are eliminated, working from the arch to the heel then from the arch to the toe. Tacks or cement adhere the arch, heel, and toe to the insole. 5 The tacks holding the insole to the last are removed. The boot, still stretched over the last, is placed into a drying chamber. Heat is applied to set the boot to the length and width of the last. A worker then removes the last from the interior of the skate boot. 6 The boot is placed upside down on a peg under an electric grinder to remove the leather finish from the boot bottom. The grinding process causes a crevice to form across the middle of the boot bottom where the foot's natural arch occurs. This crevice is packed with a synthetic filler and an 18-gauge spring-steel arch support shank. A leather or rubber sole is then attached to the boot with a urethane base cement. 7 The heel is constructed by gluing square stacks of leather or water-repellent fiberboard on top of each other. The height and width of the heel varies with the type of skate. The heel is glued onto the boot and then six to ten long nails are driven through the heel, outsole, and insole. Finally, the heel is trimmed and smoothed. 8 The sole and heel plates of the blade are lined up with the sole and heel area of the boot bottom. The worker "eyes" the placement, making sure that the blade is centered on the sole. An equal amount of boot bottom should be exposed at the toe and heel. The worker then screws the blade onto the boot using a high-speed drill on a foot-powered press. 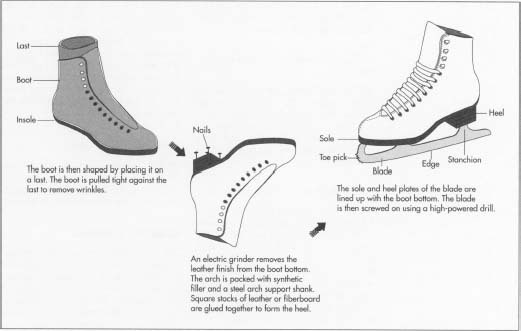 Only a few of the screws are inserted into the boot; the remainder are packaged with the ice skates. This allows the skater to adjust the blade as necessary before the remaining screws are inserted and tightened. However, the blades of skates fitted with rubber soles are permanently attached with rivets. 9 The completed skate is hand-polished and sprayed with a solution to make it shine. Laces are threaded through the eyelets. The skates are then boxed for shipping. The manufacturing process includes several inspection points. At each position, the inspector checks the alignment of the various pieces. Seams and eyelets are checked for straightness and evenness. Structural and visual imperfections such as loose threads and wrinkles are weeded out. Most ice skate manufacturers have professional skaters on staff who are involved in the design and testing of the product. Jonland, Einar and Jim Fitzgerald. Inside Ice Skating. Contemporary Books, 1978. Faiad, Andrea. "The Making of a Boot the Riedell Way." Skating, March 1995, pp. 40-41. I read your article and it provided me with a lot of valuable informtion. However, I have a sugestion that will inhance the facts you presently have written. If you wrote why the materials were used,(for example, 'leather becuase it is strong') it would show how much you really know about the subject of ice skates. Thank you. I was using this article as an information source for my science project. In my science project, i have to pick an object, write about it's materials, why the materials were chosen , the function of the object, and the history of the object. I was able to find most of my info here, but i did not find out about why the materials were chosen. I think it would be very halpful to add that to your article.